The California Public Utilities Commission is planning to introduce a new area code to the 805, which includes most of San Luis Obispo, Santa Barbara and Ventura counties, as well as small portions of Monterey and Kern counties. The 805 is expected to use up its available prefixes by Dec. 2018. The CPUC will hold meetings on Aug. 22 and 23 to inform the public of the pending changes and listen to any concerns individuals may have about the new area code. Meetings will be held in Santa Barbara, San Luis Obispo and Oxnard. Check here for meeting times. Even though a new area code is being added, existing 805 customers will be permitted to keep their current phone numbers, including area code. 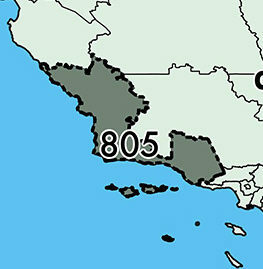 The 805 area code serves the cities of Arroyo Grande, Atascadero, Grover Beach, Morro Bay, Pismo Beach and San Luis Obispo in San Luis Obispo County; Buellton, Carpinteria, Goleta, Guadalupe, Lompoc, Santa Barbara, Santa Maria and Solvang in Santa Barbara County; Camarillo, Fillmore, Moorpark, Ojai, Oxnard, Port Hueneme, Santa Paula, Simi Valley and Thousand Oaks and Ventura in Ventura County. In 1957, the 805 area code was created because of a shortage of 213 area code prefixes. According to the CPUC, this will be an area code overlay. That means the new area code will have the exact same boundaries as the existing 805 area code. The phone companies prefer this solution as it is much easier to implement than an area code split. Because this is an overlay, they will probably implement 1+10 digit dialing here. This means you will be required to use the area code for all calls (plus the prefix of 1) regardless of what number you are calling. I miss the days of 5 digit dialing (but not the party lines). I checked the website for the organization which assigns area codes, and a new one has not been assigned yet. I smell a new beer brewing already! What will all of the guys with 805 tattoos on their neck do? Last time I looked, Paso also used 805. Why the obvious oversight? Well since we invented the telephone and had them widely in place long before the “rest of the world” no one envisioned the need for literally billions of phone numbers here. Once the infrastructure was in place it was hard to change it. So yes, it was American exceptionalism that got us here. The chances of changing the length of phone numbers in the US is somewhere between slim and none. The number of companies who store phone numbers in databases and files is huge. Any transformation would dwarf the Y2K changes made prior to 2000. Well, whatever- just don’t make it 666. Unless of course you’re an SLO county government administrator. FYI, every letter in Hebrew is also a number. In Hebrew, 666 = Caesar Nero. 666 also reminds me of Adam Hill. Adam Hill is a legend in his own demented mind. OMG what will Firestone Walker Brewing Company do?! ….and what about all those “Lookit Me, I’m from the Central Coast!” guys with 805 decals on their cars? Great article, but one tiny detail missing that would be interesting: what will the new area code number be?? ?